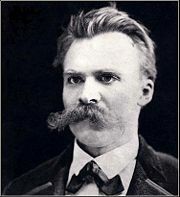 Friedrich Nietzsche introduced the concept of the death of God, which became a key idea in the "radical theology" of the 1960s. The theology of the Death of God, also known as Radical Theology, is a contemporary theological movement challenging traditional Judeo-Christian beliefs about God and asserting that human beings must take moral and spiritual responsibility for themselves. The term "death of God" originated from the writings of Friedrich Nietzsche in the nineteenth century, and was later developed by several theological writers of the early and mid twentieth century, evolving into the death of God movement of the 1960s and beyond. For Nietzsche, the supposed death of the Christian concept of God signaled a moral and spiritual crisis for modern civilization, but also meant that people could free themselves from externally-imposed limitations and develop themselves into a new type of heroic human being termed the Übermensch (superman). Nietzsche's ideas were refined and carried forward in the philosophy of Martin Heidegger, and the theology of the Christian existentialists, who emphasized human moral and spiritual responsibility. In the 1960s, the death of God movement in Christian theology rejected the concept of a transcendent God, but affirmed that God's immanent love could be experienced in the Christian community. Gabriel Vahanian and Thomas J. J. Altizer were leading exponents of this view. In the Jewish tradition, Richard Rubenstein's book, After Auschwitz, made a major impact on Jewish culture, arguing that Jews must take their destiny into their own hands and reject the idea of a God who intervenes in history and punishes the Jews for their sins. Although the concept of the death of God failed to gain wide popular acceptance, many of its associated ideas have won considerably popularity. "God is dead" (German: "Gott ist tot") is a widely-quoted and sometimes misconstrued statement by German philosopher Friedrich Nietzsche. It first appears in his The Gay Science, but is found several times in Nietzsche's writings, most famously in his classic work, Thus Spoke Zarathustra. In Nietzsche's thought, "God is dead" does not mean "God is now physically dead." Rather, it is his way of saying that the idea of God is no longer capable of acting as a source of any moral code or sense of directed historical purpose. Nietzsche recognized the crisis which the "death of God" represents for existing moral considerations. "When one gives up the Christian faith," he wrote, "one pulls the right to Christian morality out from under one's feet." The death of God is thus a way of saying that modern humans are no longer able to believe blindly in the cosmic order described by the Christian religion. It will lead, Nietzsche says, not only to the rejection of a belief in cosmic order but also to a rejection of absolute values themselves, and thus to nihilism. This meant, to Nietzsche, that one must look for moral foundations that go beyond the traditional Christian values. Nietzsche believed that when the death of God finally began to become widely acknowledged, people would despair and nihilism would become rampant, including the relativistic belief that human will is a law unto itself—"anything goes and all is permitted." Nevertheless, Nietzsche believed there could be positive possibilities for humans in a godless world. Relinquishing the belief in God, he wrote, opens the way for human creative abilities to fully develop. With the concept of God holding them back, human beings might stop turning their eyes toward a supernatural realm and begin to acknowledge the value of this world. Martin Heidegger came to grips with this part of Nietzsche's philosophy by looking at it as death of metaphysics. In his view, Nietzsche's words can be best understood as referring not to the concept of God per se but to the end of philosophy itself. Philosophy had, in Heidegger's words, reached its maximum potential as metaphysics, and Nietzsche's words warn us of its demise and that of any metaphysical world view. If metaphysics is dead, Heidegger warned, it is because from its inception that was its fate. As Nietzsche's ideas regarding the death of God sprouted in the minds of twentieth century intellectuals like Heidegger and others, they gradually bore fruit in existentialist theology and other trends which downplayed God's direct involvement in history and emphasized the human role in realizing a good or meaningful life. 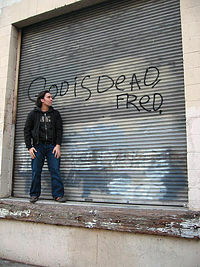 Loading dock graffiti proclaims "God Is Dead, Fred"
By the 1960s, the "death of God" theological movement had taken on a specific form and developed a considerable influence. Also known as "radical theology," it is sometimes technically referred to as "theothanatology," derived from the Greek Theos (God) and Thanatos (death). The cover of Time magazine on April 8, 1966, boldly asked "Is God Dead?" The accompanying article concerned caused a firestorm of reaction but also served to further popularize the concept of the death of God. The main protagonists of this theology included the Christian theologians Gabriel Vahanian, Paul van Buren, William Hamilton, and Thomas J. J. Altizer, and the Jewish writer Rabbi Richard Rubenstein. Vahanian's book The Death of God was published in 1961. He argued that modern secular culture had lost all sense of the sacred, lacking any sacramental meaning, transcendental purpose, or sense of providence. He concluded that for the modern mind "God is dead." However, he did not mean that God does not exist. In Vahanian's vision, a transformed post-Christian and post-modern culture was needed to create a renewed experience of deity. Van Buren and Hamilton agreed that the concept of divine transcendence had lost any meaningful place in modern thought. According to the norms of contemporary modern thought, God is dead. In responding to this collapse in the concept of transcendence, Van Buren and Hamilton offered secular people the option of Jesus as the model human who acted in love. Thus, even though the transcendent God was no longer relevant or "alive," the immanent God could be experienced through the love of Jesus, as experienced in the Christian church. Altizer's "radical theology" of the death of God drew upon William Blake, as well as Hegelian thought and Nietzschean ideas. He conceived of theology as a form of poetry, in which—as with Van Buren and Hamilton—the immanence of God could be encountered in faith communities. However, he rejected the continued belief in a transcendent God even theoretically. Altizer taught that God had incarnated in Christ and imparted his immanent spirit through him. This remained in the world through the church even though Jesus, the incarnate God, was dead. Altizer thus believed that the transcendent God had truly died, not just in theory, but also in reality, with the death of Jesus. Richard Rubenstein expressed the theology of the death of God in a contemporary Jewish context. Traditional Judaism had long believed that Jewish suffering was justly imposed on them by God, but for Rubenstein the experience of the Holocaust made this view both untenable and morally heinous. He argued that is no longer possible to believe in the God of the Abrahamic covenant who rewards and punishes his chosen people. Instead, Jews must act to take history into their own hands and must not meekly rely on God's intervention to protect them from persecution. In a technical sense, based on the Kabbalah, Rubenstein maintained that God had "died" in creating the world through the process of tzimtzum, by retracting Himself into a void to make space for existence. Rubenstein's views struck a resonant chord with secular Jews in the relatively early days of the newly-formed state of Israel, which struggled to create a secure homeland for Jewish victims of the Holocaust. Thus, unlike other "death of God" theologians, his ideas regarding human responsibility for history made a large impact on the mainstream Jewish community, even though the concept of the death of God itself was rejected by religious Jews. His book, After Auschwitz (1966), not only earned him the title of the leading Jewish death of God theologian, but also launched the field of study known as Holocaust theology. A church's Cross declares "God is not dead." Since the 1960s, Christians have answered Nietzsche's challenge with slogans such as "'God is dead'… Nietzsche; 'Nietzsche is dead'… God." Indeed, religion appears to have undergone a rebirth in recent decades in many parts of the world. Nevertheless, some of the philosophical attitudes of radical theology have found their way into the main stream of western societies, both in a constructive and a destructive sense. On the positive side, religious people tend less to surrender moral responsibility for world events to God, and the idea that God's love is most meaningfully experienced in Christian community has become prevalent. On the other hand, Nietzsche seems to have proven to be prophetic with regard to the prevalence of moral relativism and the growth of nihilism in contemporary society. The death of God movement in theology may have been doomed from the start by its very name, with which few religious people could ever associate themselves. However, its ideas remain extremely germane to the core issues human responsibility and God's relationship—if any—to the world of human existence. Altizer, Thomas J. J., and William Hamilton. Radical Theology and the Death of God. Indianapolis: Bobbs-Merrill, 1966. OCLC 383781. Haynes, Stephen R., and John K. Roth. The Death of God Movement and the Holocaust: Radical Theology Encounters the Shoah. Westport, Conn: Greenwood Press, 1999. ISBN 9780313303654. Kaufmann, Walter. Nietzsche: Philosopher, Psychologist, Antichrist. Princeton: Princeton University Press, 1974. ISBN 9780691019833. Roberts, Tyler T. Contesting Spirit: Nietzsche, Affirmation, Religion. Princeton: Princeton University Press, 1998. ISBN 9780691001272. Rubenstein, Richard L. After Auschwitz; Radical Theology and Contemporary Judaism. Indianapolis: Bobbs-Merrill, 1966. OCLC 2118249. Vahanian, Gabriel. The Death of God; The Culture of Our Post-Christian Era. New York: G. Braziller, 1961. OCLC 312626. History of "Death of God"